It's more than just a job, want to know why? We are looking for part-time worker owners, like you! Learn more at our info session on Feb 6th at 7:00pm. Note: Buzz -1b and head to main entrance to the first floor conference room. 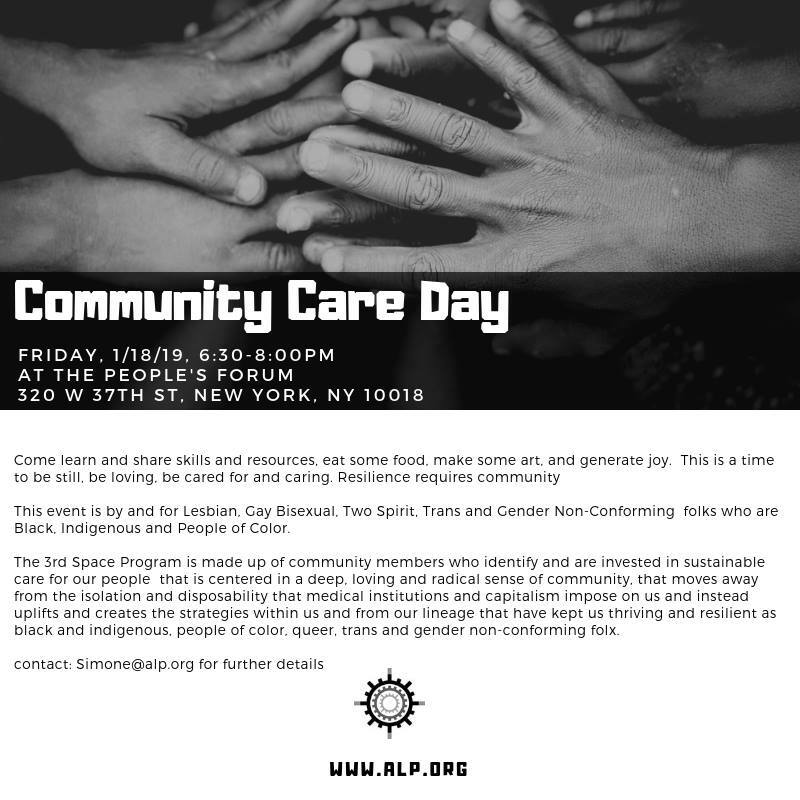 Join us at ALP’s Community Care Day next Friday! 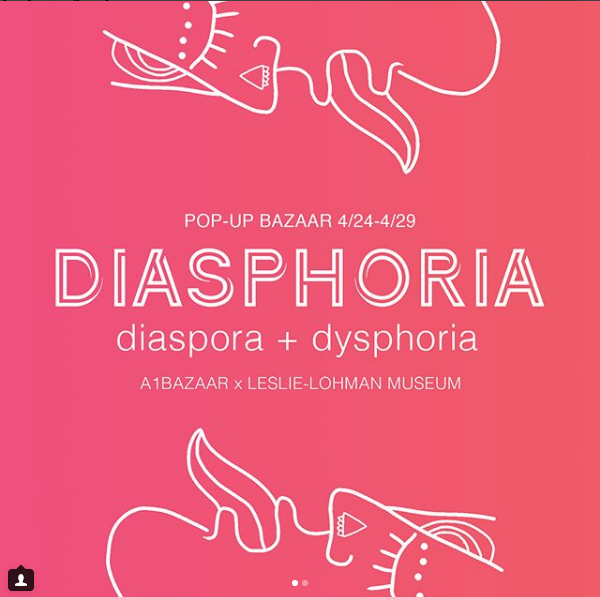 A1Bazaar is excited to announce an open call for Diasphoria, a pop-up bazaar exploring the South Asian diaspora and gender dysphoria. Diasphoria arises at the intersections of displacement and dispersal as it occurs in place/culture, body/gender, reality/imagination, and so on. We ask creators to respond to one or more of the following themes: queerness, trans/gnc/nonbinary experience, and diasporic bodies. The Diasphoria Bazaar is curated by A1Bazaar (A1), whose mission is to create bazaar experiences that uplift artists and small business owners of the South Asian diaspora and beyond. A1 curates digital and physical bazaars that allow artists and small business owners to exhibit and sell their work. A1 was founded by queer/trans* artists, organizers, and curators of color. As a community-led project, A1 strives to promote inclusion, equity, cooperation, and creativity. Join Khao'na Kitchen at the Lunch and Vendors/Practitioners Market during the Who Heals the Healer convergence! 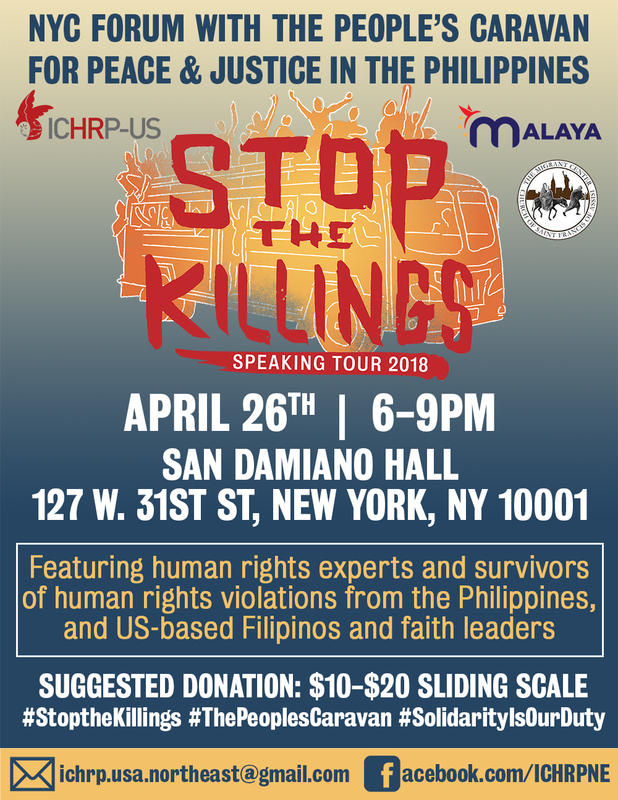 Join Khao'na Kitchen as we support the people's efforts for self-determination and try some of our tasty "secret menu" items like Sizzling Turkey Sisig and Ginataang Gulay. Bring a friend! No one will turned away for lack of funds. 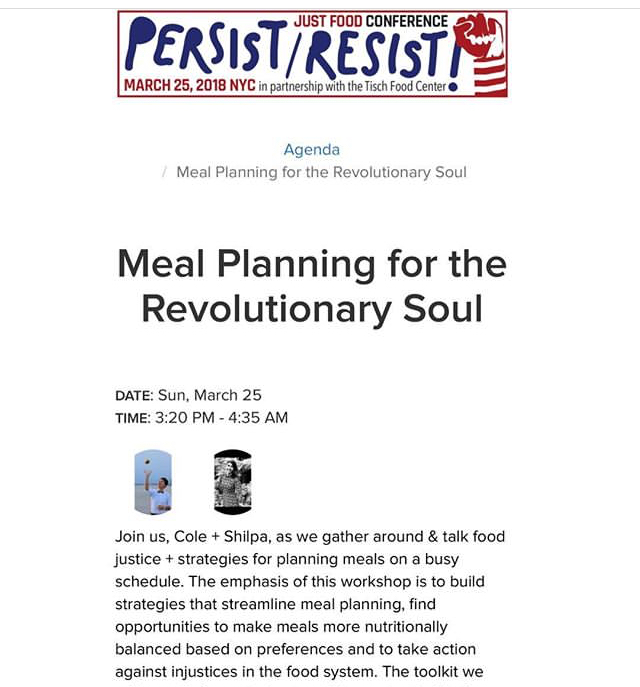 Join us, Cole + Shilpa, as we gather around dinner, provided by Khao'na Kitchen, and talk food justice and strategies for planning meals on a busy schedule. Our upcoming Meal Planning workshops are designed to apply to most individuals. The emphasis of the workshop is to build strategies that streamline meal planning to make planning less overwhelming and find opportunities to make meals more nutritionally balanced for the individual, based on their preferences. The toolkit we will provide participants with will be customizable for any dietary preference so bring all of your dreams and imaginations to plan with. In addition, the conversation around diet, nutrition and food justice will be applicable to any type of diet (read: way people eat), so diverse perspectives and experiences are more than welcome to join in and share! Space is limited! RSVP here. 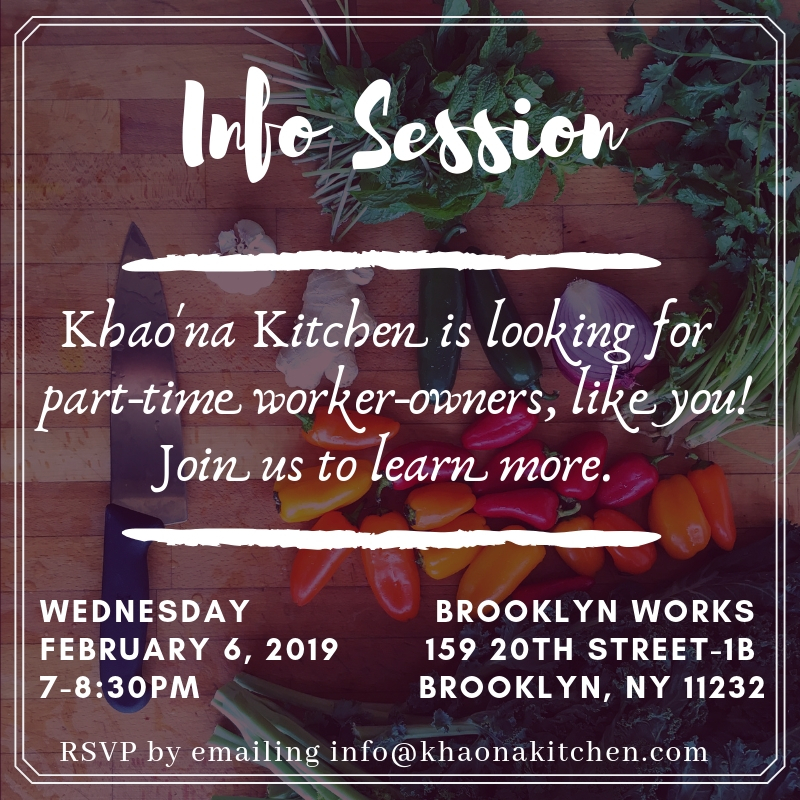 Khao'na Kitchen is a queer, gender non-conforming woman and people of color-run worker cooperative based in Brooklyn, NY. We welcome and support all lifestyles and identities, without judgment, body-shaming or hesitation. ITS US!! Come check us out today at the Just Food Conference. We feel so honored to be able to share space with such dope food justice advocates, farmers, and community organizers. P.s. 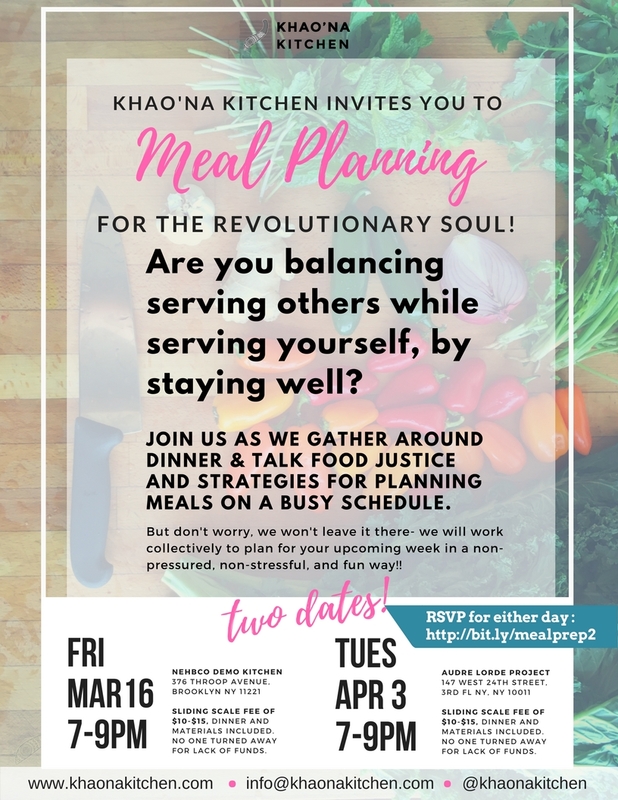 if you can’t make it out but still want to know about our meal planning session, we still have a few spots remaining at out April 3 workshop!! !